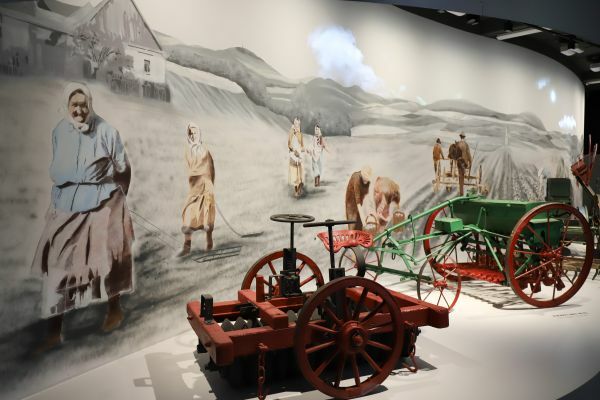 To mark the occasion of the one-hundredth anniversary of the foundation of the National Museum of Agriculture, we have opened the new interactive, dynamic and modern “Agriculture” exhibition. The exhibition creates a notional core of the presentation concept of the main museum building in Letná with its foundation in exhibits thematically focusing on nature and culminating in exhibits devoted to food and life. Agriculture from the Neolithic period constitutes the foundation of our entire society and is the most significant contribution to humankind, enabling the development of further industries, science and technology. The motto of the entire Agriculture exhibition is “Moderation” or “The Path of Common Sense”, where the current generation knowledgeable from the past is responsible for the future generation. Technologies and ideologies may change, but the respect of humans for nature and its resources as a basis for a sustainable and happy future must remain. Here, you can find unique collection items including many specimens of farm animals, listen to stories of our ancestors, and learn about the history of agriculture and the cycle of the business year. The exhibition’s most prominent feature is César the bull, the best breeding male from the first Czech insemination station. On the other side of the room, you can take a look at an original plough from the Veverka cousins, who initiated an era of new agricultural technology and innovations in the 19th century. The exhibition was created to mark the one-hundredth anniversary of the National Museum of Agriculture.